Just a quick post as I'm heading out the door soon. 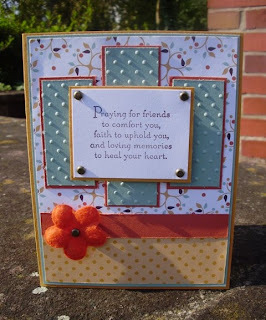 This is a card for some friends who recently lost their mom from breast cancer. I used Mojo103 sketch for this card and it came out just as expected. I love this sketch I think I'll be using it for one of my Christmas cards this year. Hope everyone has a great week! Hi Everyone! I've finished my first Christmas card for this year's batch. Actually this will be one of our Christmas cards for Christmas card class. I used the sketch #232 from SCS. 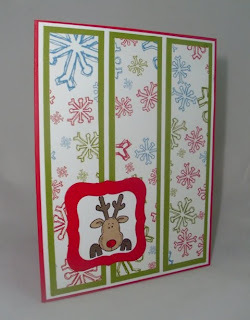 I used an OLD stamp set from 1999 called Holiday Helpers. I love the little 4 images because they fit perfect in the square or circle punches. Hope you enjoy the card! Just a quick post tonight. I needed to make a few thank you cards for some people who helped our hispanic american club cook dinner for the Warrior Center on Landstuhl. The Warrior Center is a center for the wounded warriors who are in Germany at Landstuhl hospital recovering from injuries. Our club cooks dinner for them every other month and this month they were served a great Panamanian meal. I used Mojo Monday sketch 98 for my inspiration. This week is Vacation Bible School for us! What an exciting time for all the kids. I am volunteering all week long and one of the organizers asked me to make thank you cards for the private organizations who provided snacks throughout the week for the volunteers. Of course I said YES! I went with the theme of VBS which is Kingdom of the Son it has all the animals from the Wild About You set by Stampin' Up! so I thought perfect! I used Taylored Expressions sketch challenge #75 this last friday it was a perfect sketch for my card. I personalized each card by stamping the initials of the private org's name on the front. Animal Crackers Jack Stripe by Making Memories is the scrapbook paper I used on the cards. The ribbon comes from Taylored Expressions online store. I am so ashamed..lol 3 months?!! I don't even know if anyone is following me anymore. :) You know I went through this long 3 month hiatus and I don't think I touched any of my stamp supplies but maybe 4 times. And those 4 cards that I did make I didn't even snap a pic and post them. I don't know what happened to me I just was not interested. But yesterday yesterday something happened. I was cleaning out my stamps and organizing them to look nice and neat when it hit me I REALLY enjoy making cards and giving them to the people that mean so much to me so why did I quit? I realized how much fun it is and so I'm on a mission..to start fresh all over again! 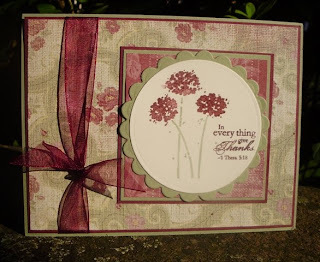 This card was a birthday card for my friend June who just recently celebrated a birthday. 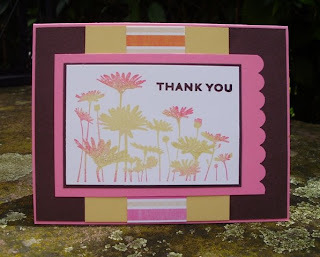 I used Basic Grey at the card base and layered it with So Saffron, the patterned paper I do not remember who it is by. 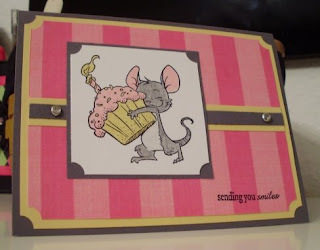 The image is from Whiff of Joy Stamps. 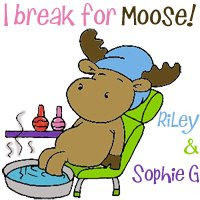 I saw this stamp on someone's blog and thought it was the cutest image ever! I went online to order it and saw they are based out of Europe which was great because I got my stamp a few days after ordering. I was just able to have it shipped directly to my house in Germany rather than waiting for it to come to my U.S. addy! Anyway I hope those who are still here enjoy the card and you can count on finding some more soon. I think I'll take the pressure off of myself by trying (or thinking I need to be posting daily) because I think that's really what got me. I don't know why I felt as if I needed to post something every day. I don't have time to post something every single day. I have a husband and family who demand my attention and lots of other commitments so why I put that pressure on myself is beyond me. LOL I do have 15 thank you cards that need to be made by Friday so be on the lookout for those coming up! Enjoy the card. Everyone's probably noticed the new overhaul on my blog. I wanted something fresh and new. 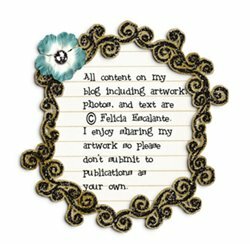 I was visiting someone's blog a couple months ago and read that Shelsscraps had made the banner,background page, etc. I contacted Shel and let her know what I was looking for. She was absolutely wonderful to work with! She tweaked whatever I wanted tweaked. She even gave me the 3 column layout which I had no clue how to do. She even made me a matching watermark. I just haven't used it yet. But I will soon! Thank you Shel for making my blog page exactly what I wanted. Next time I'm in the mood to change you'll have a returning customer! I still have some things to add but need to find the time to make it all complete. I hope you are enjoying the fresh cute colors!